Take I-94 west to Ann Arbor (approximately 18 miles). Turn north onto US-23 (exit 180). Get off at the Plymouth Road exit and head west (left) on Plymouth Road. At the third stop light, turn south (left) onto Huron Parkway. The first street to the left is Baxter Road, and UMTRI is on the left-hand corner. There is ample parking around the building. Take the Lodge Freeway (US-10) north and follow the signs for I-96 to Lansing. Take I-96 to M-14 (approximately 22 miles). Exit to left and take M-14 to US-23 (approximately 16 miles). 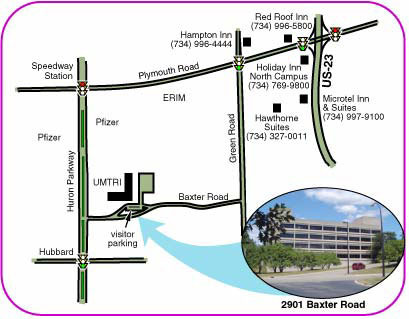 Get off at the Plymouth Road exit and follow the directions listed above. This material can also be found on UMTRI's "Getting to UMTRI" page. 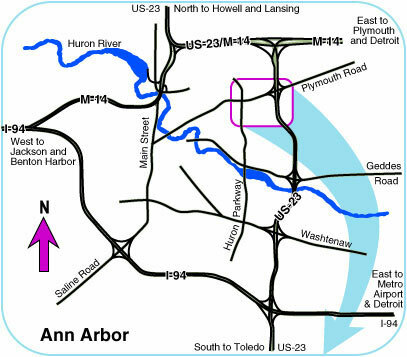 Additional maps of Ann Arbor and the University of Michigan Campus can be found on the University of Michigan News and Information page.